Canadian artists Helen and Alan Spinney reside in Moncton, NB which makes them awesome East Coasters like me. I found this debut issue at Strange Adventures on a work break. This is one of the strangest first issues of anything that I've ever read. I hardly know what's going on. It starts off with some kids who were accused of knocking over tombstones at a local grave ybrard. Our main character who has nicknamed herself Echo is sort of your typical angsty teen. She appears to have a caring family even though they apparently keep things from her and avoid speaking of serious and unpleasant things. She also seems to lack any sort of common sense and by the end of the book is ingesting some interesting confetti that fell off some ghost. I don't want to say to much more. Seriously though, who eats ectoplasam confetti? According to the Spinney website Spinney works mostly with oil paints. 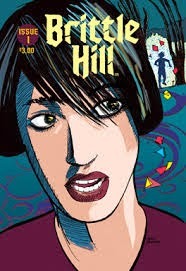 Although I couldn't find any specific info pertaining to the media used in Brittle Hill.